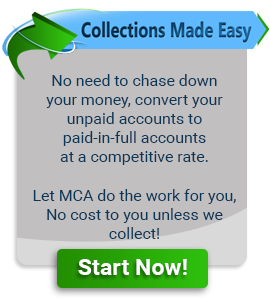 MCA Collection Agency originated as Medical-Commercial Audit, Inc in 1950 and has been in constant operation since that time. Throughout the years this bonded debt collection agency has maintained an impeccable track record of service with our clients. Our commitment stems from the professionalism inspired by the company’s management team. We promote sound business ethics with our staff by participating in ongoing training programs and active involvement with professional organizations. MCA is a member of the American Collectors Association and the Missouri Collectors Association, along with the Better Business Bureau, Fenton Chamber of Commerce and the NFIB . In addition to our belief in an ethical and professional image, we know your public image is of major concern, that is why our financial counselors take special care in preserving that image. By motivating them to be “PROBLEM SOLVERS” and not “PROBLEM CREATORS,” we maintain that professional edge over our competition. Our company is based on the belief that our customers’ needs are of the utmost importance. Our entire team is committed to meeting those needs. As a result, a high percentage of our business is from repeat customers and referrals. Along with repeat customers we also have a number of the staff that have been with MCA for 20 plus years. Since we are a family owned business we believe in personal service to our clients and your customers. We answer all phone calls during normal business hours, no automated attendant and/or voice mail!